Are women better at team stuff? 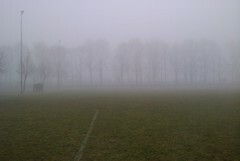 Last week I went to support Joris, my eldest son, during his Saturday morning football game. He is 8 years old and plays in the F1 of the local football club. At that age the young football players typically learn how to play together as a team. They begin to understand that a game strategy of “everyone after the ball” is not a very productive one, and that “only one has the ball all of the time” does not work well either. At this skill level, working together effectively will greatly enhance your chance of winning as the opposition is also just beginning to grasp this important team concept. Unfortunately, the odds were against the F1 on this particular Saturday. To take all the suspense awa y immediately: they lost 6-1. But not because of lack of effort. They actually worked very hard and fought to score. It was cold and rainy but they went at it and did their best. They really wanted to win. And so did their coaches, as they became louder and more verbally involved as the game progressed. So why did they loose? Why was the players’ hard work on the field not enough? And why did the other team seem to win so easily? I guess I will never know the exact answer to that, but there was a striking difference that I noticed between the two teams; the coaches. The other team’s coach stood quiet, with arms crossed, alongside the field, making short remarks only when a player passed nearby. This was certainly a strong contrast to most coaches that I have seen during the past years in this junior league of football. They tend to to be loud, inconsistent and increasingly directive and agitated as the game develops. It was a fascinating sight to see this junior opponent team be so effortlessly successful. I believe that this team had won even before they stepped onto the field. Their coach had given structure to their execution of play. Each individual player had their position to which they adhered, and therefore they passed the ball around much quicker than our players could run. The coach left the execution of the game to the players, correcting them only when a player forgot about his position. The players played independently but at the same time loosely confined to their field position. There was team spirit (even a team yell to intimidate us) and the coach seemed to affirm more than criticize. And they had fun. Success was pre-programmed. So team structure defined their success of execution. The team connection was more important than the individual player’s effort; Think before you do. Better yet: the coach should think before the players do. And that thinking and making a team plan, started long before that one game on Saturday. This team’s success was largely determined by their coach’s ability to design, to connect and to build a team. Her added value was creating the preconditions for winning the game… Yes, that’s right: her added value. This particular opponent on Saturday had a female coach. Was that maybe the real reason for their success? Are women better at building and running a team? It certainly has kept me wondering these past few days. So help me out. Please share your thoughts on these two burning questions. Does a good team plan attribute more to success than good individual execution? Are women better at this team stuff than men?